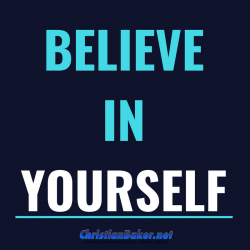 Do you believe in yourself, would you like to know how you can believe in yourself more? If you don’t have faith in yourself, if you feel like something is holding you back the maybe it’s time to programme yourself for more self-belief. Do you belief in yourself, would you back yourself, if not why not? If you don’t believe in yourself why should anyone else. We are often our own worse critics, so maybe it’s time to stop doubting yourself, start backing yourself, improve your self-talk and change the quality of the language you use. A good way to change your programming is to use one of my mind re-programming audios, to help shift your programming and get your subconscious beliefs up to date, like a software update. Your action from this video is to write down 10 statements that you would like to be true. If anything was possible, if you could programme your mind to believe in yourself more, what would you like you mind to do, think, feel. You then have 10 of your own personal power statements, that you can read, repeat to yourself, reflect and help yourself to start to believe in yourself more. it’s time for you to think differently, to believe in yourself, so you can achieve the life that you want now!